(Macao, Dec. 23, 2016) – Celebrate New Year’s Eve at Sands Resorts Cotai Strip Macao! With the biggest countdown celebrations along the Cotai Strip, live music from top international bands, dance performances, and a spectacular fireworks show at midnight, the integrated resort will be THE place to welcome in 2017. Outdoor events start at 8:30 p.m. at The Venetian® Macao lagoon area, and for the first time guests will also be able to enjoy the celebrations at The Parisian Macao. Admission is free, and open to guests, visitors and Macao locals to come and be part of the festivities. The entertainment for this New Year’s Eve at The Venetian Macao includes performances from the Lucky 5 band, who will wow audiences with their pop/blues/RnB/Latin repertoire. NYE Dance Crew will also be performing high energy, up-tempo moves to the latest chart hits, and popular band Andy Frasco & The U.N. from the USA, who have been described as a “boisterous blend of harmonic funk and jazzy influences, with boundless energy” will be returning to The Venetian Macao. Visitors can also enjoy a specially created New Year’s Eve countdown projection light show across the façade of The Venetian Macao which will be followed by a spectacular fireworks display to welcome in 2017. For the first time 17 Happy Gathering – LEXUS 2017 JSTV New Year’s Eve Concert, China’s most-watched NYE countdown show, is coming to Macao and will be broadcast live from the Cotai Arena at The Venetian Macao. Meanwhile at The Parisian Macao, party-goers will be entertained by can-can and ballroom dance performances, DJs, live music from Sands Resorts Cotai Strip Macao’s resident band Blue Note, as well as one of Hong Kong’s biggest rock bands Mr., along with an amazing Eiffel Tower New Year’s Eve light show illumination countdown and dazzling pyrotechnics. Five talented young singers – AJ, Hyper, Josie, Cherry and Sophia – will also perform two exciting 10-minute sets at the forecourt stage, at 21:45 p.m. and 22:40 p.m. Audiences will not want to miss this show! Guests who want to celebrate into the early hours will enjoy the Ministry of Sound New Year’s Eve Countdown After Party with Shaun Frank and Delaney Jane, at the Cotai Expo Hall F at The Venetian Macao. Ministry of Sound is known around the world for its cutting edge electronic dance music acts, and revellers will be able to dance the night away to Frank and Jane’s many international hits. The show starts from 11 p.m. and tickets are just MOP/HKD 288 (including one standard drink). 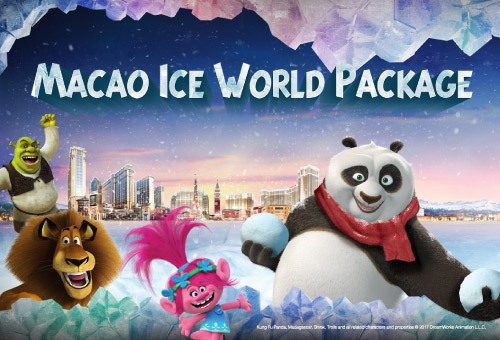 The DreamWorks Experience Winter Celebration at Sands Resorts Cotai Strip Macao returns for the fourth year in a row, and if you want to ring in 2017 in style, King Julien from the “Madagascar” movies invites you to his rocking New Year’s Eve party on Dec. 31, 6 p.m. to 8:30 p.m. at Level 4, Urumqi Ballroom, Sands Cotai Central. King Julien’s New Year’s Eve Party with The DreamWorks All-Stars has the DreamWorks friends joining in the royal party to celebrate the new year with a range of delicious dishes and high energy performances. Each child will also receive a complimentary DreamWorks plush toy. Tickets are MOP 498* for adults, MOP 268* for children ages 4-12 and MOP 1,450* for family package (including three family members and one child). *Subject to 10% service charge. Terms and Condition Apply. Sands China Ltd. is the leading developer, owner and operator of integrated resorts in Macao. The fittingly named Sands Resorts Cotai Strip Macao, situated on reclaimed land between the islands of Coloane and Taipa, is a single destination providing a stunning array of experiences at the heart of Cotai. Sands Resorts Cotai Strip Macao has transformed a day-trip market into an integrated resort city and international hub for business and leisure travellers. Pulsating with life, both night and day, Sands Resorts Cotai Strip Macao features an expansive offering of affordable luxury available nowhere else in Macao. With the opening of The Parisian Macao, it now boasts approximately 13,000 hotel rooms and suites, international superstar live entertainment, duty free shopping with more than 850 retailers offering a huge array of name brands, meeting and exhibition space for Asia’s leading conferences and exhibitions, transportation offerings and well over 150 dining options, including Michelin-starred restaurants, bars and lounges. Sands Resorts Cotai Strip Macao is a must-go destination providing every guest with an unforgettable experience and unparalleled excitement. Comprised of The Venetian® Macao; The Plaza™ Macao, featuring the Four Seasons Hotel Macao; and Sands® Cotai Central, including the world’s largest Conrad, Sheraton, and St. Regis hotels as well as the Holiday Inn, Sands Resorts Cotai Strip Macao is where Asia’s ultimate destination is within reach. And now the crowning achievement of Sheldon G. Adelson’s vision of the Cotai Strip – The Parisian Macao. For more information, please visit ParisianMacao.com. For more information about Sands Resorts Cotai Strip Macao, please visit http://en.sandsresortsmacao.com.. For more information, please visit ParisianMacao.com. For more information, please visit https://en.sandsresortsmacao.com.